For all skin conditions. Cleansing Cream gently cleanses, exfoliates, fortifies and refreshes, supporting the skin’s natural protective function for a healthy, radiant glow. Formulation: Calendula, chamomile, anthyllis and sweet almond meal cleanse, balance and revitalize the skin. The appearance of pores is minimized. A bit thicker and "chunkier" of a wash than I was expecting, but I actually prefer it to the milk cleanser. The gentle exfoliating is really perfect for dead skin patches while cleansing and balancing out the oily spots on my face. An essential product in the Dr. Hauschka skin care routine. I love this cream. It is not drying, but offers very effective exfoliation. It’s gentle enough to use every day. I use this daily in the morning and somehow with such simple ingredients it makes a huge difference in how my skin looks and feels. I believe it comforts and nourishes my skin. 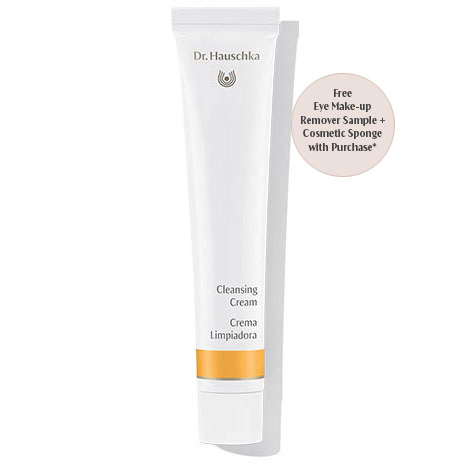 The cleansing products from Dr. Hauschka really work especially if you are dedicated to them. The Cleansing Cream, followed by Revitalizing Mask and the Firming Mask leaves the skin supple and glowing. If I could recommend these products with more stars, I would! Initially I didn’t like the scrub and sticky feeling to it but kept using it and became a convert. Nice scent and works well on my skin. I never took to the suggested application technique - rolling it on. Just warm it in your hands and apply gently. Be careful rinsing it off, it takes a bit of diligence to get it all - a washcloth with gentle motion is better than splashing water on to remove it. I have been using this cleansing cream for over 30 years. It is the only product I use and works great! Been using this cleanser for years. Nothing beats it . Cleanses beautifully without drying or scratching. Makes your skin feel so good! Is truly like a washing Cream - it makes the skin feel so pure and moisturized! I was using a different brand for many years to tread my dry skin. When I start using Dr. H. product, changes on my skin starts to show. A tiny amount of this pleasant in texture and scent cleansing cream enlivens the complection and gives it a glow of freshness. While cleansing, the almond meal as the core ingredient feels most agreeable to the skin. The Dr Hauschka cream makers certainly know what the skin naturally requires. I would say that I have pretty sensitive skin; I'm sensitive to synthetic fragrances and harsh ingredients, so even though I have somewhat acne-prone skin, salicylic acid and benzoyl peroxide are absolute no-gos for me. Over the years, I've found that natural products make such a difference in my skin and this brand is no exception. You can tell this product is really made from all natural ingredients that are processed as little as possible. The cleansing cream smells like almonds because it's made from almond meal and you can feel the softened bits of almond in it. I don't really care for the smell, only because I hate nuts in general. Even so, I can definitely tolerate the smell. It's very gentle yet effective. It makes my skin feel very soft and absolutely does not overdry. I can't comment on its ability to remove makeup because I just don't wear it. I wear mascara, but I always take it off individually no matter what cleanser I use. I love that they carry travel sizes. If you're on the fence about trying this brand and don't want to be stuck with full-size products in case you don't like them (I bet you'll love them), I'd try the travel sizes! Using the cleansing milk and the cleansing cream, has made my skin look better than ever. I struggled for a long time to find the right products for my face....these two are essential. The cleansing cream makes my skin super soft. I love it! The best cleansing cream out there!! This is the best cleansing cream on the market with absolutely no competitor as far as I'm concerned. I've used it for over 20 years...It leaves my skin soft and dewy every time with a beautiful, radiant glow. I do not leave reviews often, but I have to say that this cleansing cream combined with the milk and the day cream leaves my skin feel increasingly soft and supple. I have problem bumpiness on my cheeks that has almost completely disappeared. This line is truly holistic and amazing! Your skin will thank you for this treat every time. I use this and the cleansing milk.. great combination! It's very gentle. I will buy it again. I love this creme cleanser and go back and forth between using both cleansers depending on how my skin looks. I love the way this cream makes my skin feel. I have the Soothing Cleansing Cream which I am more than pleased with, but use this twice a week for a deeper cleanse. It is a wonder that this cleansing cream does not dry out my skin like other similar products have done, but leaves my skin feeling soft and smooth. I was beginning to think all natural skin care products were not effective, but I have finally found a company who has fulfilled my dreams. 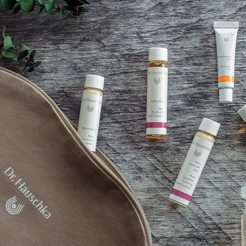 Thank you Dr. Hauschka! Keep coming back to this time after time. My skin is cleansed but not dried out. I love how it gently exfoliates and leaves my skin soft and dewy. I have used this product for over 40 years and now my children are using it as a regular part of their skin care regime. I cannot start the day without it, it seems, as my skin just feels clean and calm without being dried out. I’ve been using this cleansing cream for 23 years and can’t imagine not having it in my routine. People are always amazed at the health of my skin. These travel sizes are perfect for business trips. This cleansing cream gives me a feeling of going to a professional spa. I love the texture of this cream, although it is not a scrub, I can feel the difference of my skin after using it. The travel size of this will only last about a week (if you use it morning/night) so just be aware of that if you do end up liking this cream. I have used this product for 4 years and it works really well for my skin! It is a little expensive but worth trying! Slight grittiness of the cream helps the cleansing. But I have very fair skin so the dark color is disconcerting. I have been using this cleansing cream for 20 years and have never found anything that I like better. It cleans without drying my skin. After using the product, it leaves my skin nice and soft. It doesn’t strip the skin of moisture. Haven’t made too much progress in clearing clogged pores. I use it in the morning and in the evening and the skin on my cheeks (where is usually dry) has improved considerably. Pressing it into the skin and not using circular motion for the application works magic for me. This is a gentler exfoliation "scrub" for sensitive skin. It makes my skin feel nice, don't notice it does anything for breakouts. Like the travel size a lot. Convenient to travel with. Excellent product. Cleans skin beautifully, but less harsh as other scrubs. I use it twice a day and my skin is so smooth and blemish free. Use cleansing milk for makeup removal at night, then this after and in the morning. I expected this to be more cream-like, but it is definitely more exfoliating-scrub like. I keep it in the shower, and wash my face with it only when in there. It feels fresh and clean afterwards, and smells like pears! I don’t feel I’m stripping my skin of its health when using this cleansing cream. Just a little amount and a few drops of water....goes far. Gentle loofah sensation and leaves my skin feeling softer than before I washed. A tube lasts quite a while. This product really helps your skin, be careful not to use this product while using others. Make sure you have the right combination. Many will find the consistency of this product unusual, but it is indeed lovely! I have very dry skin, so I do prefer the cleansing lotion, but this is a top notch product. I first received this as a sample and really loved how soft my skin felt after using it. The scent is a bit unusual, but not off putting, and the gentle exfoliation from the almond meal is great. I just recently started using the cleansing cream. I love how it gently cleans and exfoliates the skin. It works well on my sensitive skin and my face is smooth and glowing after I cleanse and following up with the day cream. This has quickly become a new daily essential for me! Got the trial size with an order for free and tried it - saw no difference so I bought the bigger one to try it for a little longer - still no difference but still using it. In the morning and evening, follow with a toner, serum or intensive treatment. In the morning, protect skin with a daily moisturizer.